The Swiss Railway (SBB) system is one of the most intensive in the world and it used to be possible to view a real-time Live Trains Map of the SBB, complete with train identification and train search functionality? Unfortunately, as you will by now have found, it longer seems to be offered; indeed the http://swisstrains.ch/ web site is apparently up for sale (as at October 2015). The map used to look like the image shown below. The original Live SBB Trains map used to show actual real-time movements – alas, no longer. However, all is not lost, as an alternative is out there – to provide Swiss fans an opportunity to “watch” local, regional and inter city/national trains busily making their way across the country. You can visit another Web site to view an SBB network simulator (as depicted below) that provides an equally fascinating dynamic map but without the train search capability of the original live SBB map – check it out in your browser. With the real real-time SBB Live Map, you could find that Microsoft’s Internet Explorer was problematic. However, for this second map option, the latest IE version (IE11) seems to have no problem presenting the train movements – just as do alternative browser solutions, e.g. Google Chrome, Mozilla Firefox, or Apple Safari browsers. Simulated dynamic SBB trains map, based on timetable data – created by Vasile Cotovanu. You will see a dynamic, real-time flow of train movements, e.g. a red circle marked IC represents the movement and actual position of an Inter City express on the railway line. The schematic is based on a Google mapping and streaming train position data! Fascinating for those who enjoy a combination of Web computing, database interrogation and data output – all wrapped into a live map. Try it and see for yourself. Be aware, you’ll need to play around with it at first, e.g. the map is initially focused on the Zürich area and you will need to, either drag the map, or enter the railway station location – to find your chosen location. It is also possible to focus on one particular scheduled passenger train. 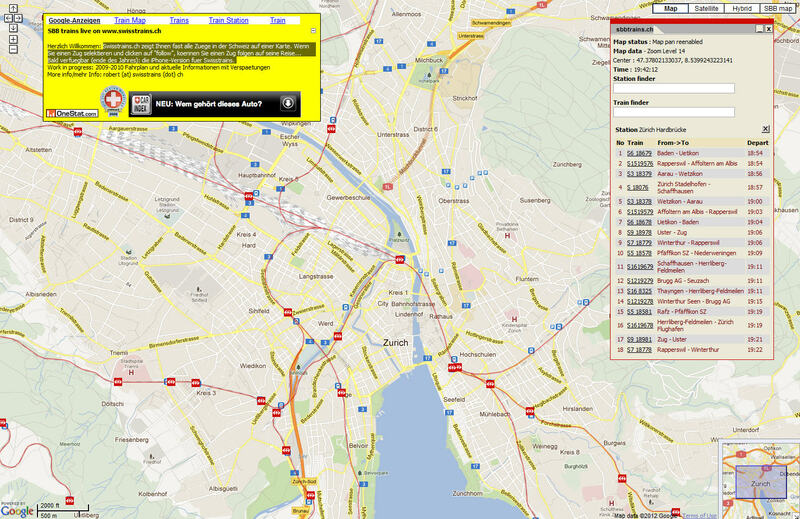 The map is not restricted to the one rail operator (SBB), e.g. it includes the RhB (Rhätische Bahn) and Europe-wide trains passing through Switzerland. As with other Google maps, it is possible to change the background to satellite view, or hybrid, and zoom in to the image of the track representation. Well worth a visit – enjoy!